Now that graduate school has released it’s unrelenting grip for the summer, it is time to get back to what is truly important: drinking. While I am suitably chagrined for believing that that Stone Brewery was in collaboration to release a Golden Imperial Stout (it was nothing more than an April Fools’ joke), my wounded pride has not stopped me from imbibing their latest collaborative effort, Saison du Buff. Stone Brewing has teamed with the Dogfish Head and Victory breweries for their latest endeavor. The heads of these respective breweries: Sam Calagione of Dogfish Head, Greg Koch of Stone, and Bill Covaleski of Victory have been in contact with each other for over 10 years. In 2003 they formed BUFF (Brewers for Freedom of Flavor). This is an alliance that is “committed to liberating collective taste buds, citing the dastardly and/or oppressive reign of so-called ‘fizzy yellow beer’.” There is hardly a more worthy goal. If you are familiar at all with these brewing companies (and you should be), you know that they create powerful, strong, flavorful, and eccentric beers (Dogfish’s tag-line is Off-centered stuff for off-centered people). The latest incarnation is no different. 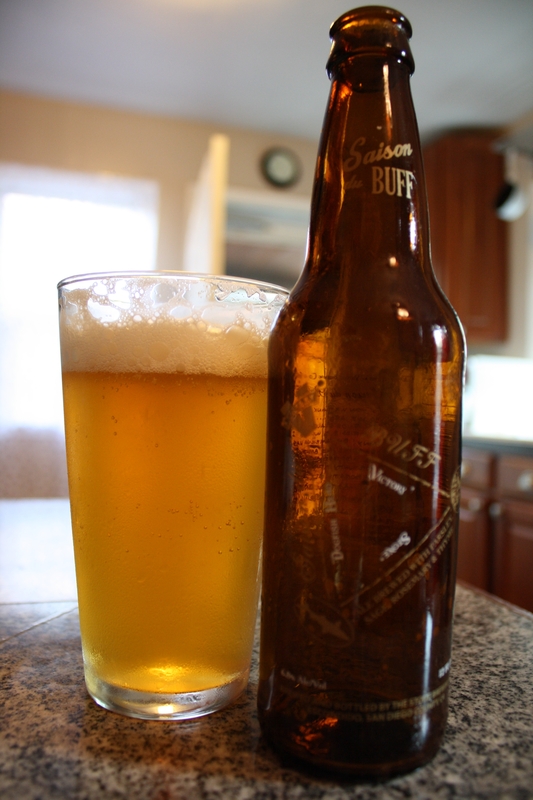 The description of Saison du Buff is an “ale brewed with parsley, sage, rosemary, and thyme”. While the immortal Paul Simon and Art Garfunkel may have eluded to the pagan belief that these spices were a love charm in Scarborough Fair, this was not love at first sight for me. This isn’t to say that it isn’t a an attractive beer it certainly is. It pours a lovely golden color with a rich stark white head and wonderful lacing. What gave me a distinct pause was the nose. I immediately recognized the telltale sour note of a Belgian style beer. I recoiled. This was the best that these three fabulous brewers could concoct: another Abby/Belgian style beer in the market? Bah. As is my wont, I was wrong again. Make no mistake, if you smell this beer you will wholeheartedly concur with me, but your palate will be completely taken aback as mine was. The first taste is quite peppery. This is the kind of pepper you would find in a full bodied syrah; it is that strong. Much of this must come from the parsley that is part of the brewing process. It’s very interesting because the bite from the pepper note blends into the bitter from the hops. It’s a very cool concept. This isn’t to say it’s overpowering in its bitterness and pepper bite. Indeed, it is quite the opposite. The bitterness is quite refreshing and is smooth and eminently drinkable. You also get hints of the rosemary towards the end of the finish, but I was a bit disappointed that there was little to no trace of the thyme or sage. Another item that surprised me was the alcoholic bite. It doesn’t have a particularly high ABV (6.8%) and I love imperial IPAs and Stouts, but it just seemed out of character with the rest of the components of the beer. I think the lighter nature of the ale doesn’t favor the stronger alcohol content. However, it did pair exceptionally well with the quasi-fra diavolo sauce I made this evening. It cut through the heat of the red peppers and in turn the sauce brightened up the beer quite a bit. It brought out some citrus flavors primarily lemon and grapefruit. Each of the breweries will be taking turns throughout the year brewing the Saison du Buff at their own establishment. The beer I had this evening was brewed at Stone. I am curious to try the beer again when the more local Victory (July 2010) and Dogfish Head (August 2010) breweries take a stab at it. While these three men are collaborators, they are also men who are very proud of their craft. I wouldn’t be shocked if each brewer makes just a little tweak when it is their turn to brew this beer if only in the spirit of making it a touch better. I hope they prove me right. ~ by its12oclocksomewhere on July 14, 2010.